On August 3 & 4, Midway First Presbyterian Church located at 672 N. Coastal Highway will host the very first International Conference to honor Liberty County’s Gullah Geechee native daughter Susie King Taylor. The Susie King Taylor MAMI WATA RISING International Conference is a 2-day gathering that is Free and Open to the Public. Day 1 of the 2018 Susie King Taylor Mami Wata Rising Conference will begin with a free Reception on the evening of August 3rd and the keynote address will be presented by Dr. Clarissa Myrick-Harris, historian, former dean at Morehouse College in Atlanta, and former Savannah State University provost. Edutainment will be provided by Gullah Geechee musicians . And Hors d’Oeuvres will include a Lowcountry Boil sampler. Day 2 highlights includes a 5:00 AM Silent March and Water Ceremony on Isle of Wight where Susie King Taylor was enslaved and escaped by boat on April 13, 1862 during the Civil War; a showing of the film The Language You Cry In; Sankofa Food Bazaar; and the Susie King Taylor Footprints to Freedom Tour. It will close with a Special Ceremony commemorating Taylor’s 170th birthday. The conference is sponsored by the Susie King Taylor Women’s Institute and Ecology Center in Midway, GA – the freedom fighter’s hometown. The institute’s founder and executive director is Hermina Glass- Hill, an Atlanta-born historian now residing in Midway had researched Taylor’s life for nearly ten years starting while working as associate director of the Center for the Study of the Civil War Era at Kennesaw State University . She vowed to change the course and re-write Taylor back into history. The event will emphasize Gullah Geechee culture and Taylor’s place within that cultural space in of Coastal Liberty County. Mami Wata” is an cultural expression for “Mother-Water” as well as an ancient religious tradition prevalent in West Africa and later in the African-Atlantic Ocean diaspora. This is why conference organizers decided to hold the Mami Wata Rising conference within Geechee-influenced places such as her former Reconstruction era church, Medway Chapel, now known as Midway First Presbyterian Church, Grest Island where she was born, and visit Old Midway Meeting House where her slave owners were members and she most likely attended and sat upstairs in the slave gallery of the church. 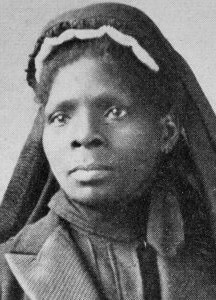 “Susie King Taylor was an intelligent, literate enslaved girl. And she is a member of this parallel Geechee community here in Midway, which was a society within society where slaves, or descendant captive Africans as well as newly captured ones had created this salient world to offset the cruelty, horrors, and vicissitudes of slavery. In their own spaces they re-created family and kinships, religion, language, foodways, medicine, nature, memory, water, love from what they remembered of their homeland Africa”, says Glass- Hill. The 2-day conference will provide new ways of understanding Susie King Taylor’s place in history. All are welcome to attend. The address is 672 N. Coastal Highway/U.S. 17. For more information about the 2018 MAMI WATA RISING International Conference, call 404-587-3182 or visit www.susiekingtaylorinstitute.org.